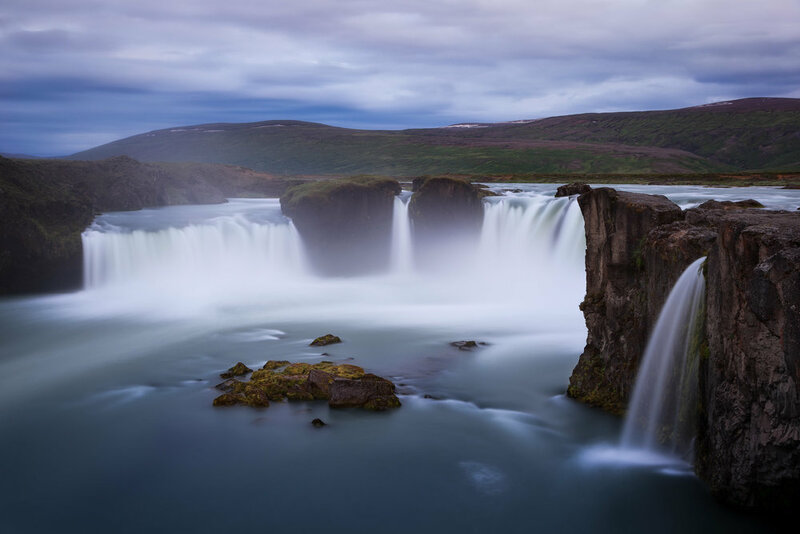 Known as the waterfall of the gods, Godafoss is a beautiful and powerful site to beyond in north central Iceland. This photo was made at Godafoss, a spectacular waterfall in northern Iceland. Godafoss translates as waterfall of the gods and is, arguably, one of the most atmospheric locations in Iceland. The most difficult thing about this image was being able to find a place from where to make the photo. The falls and river below are quite wide so many folk find themselves photographing from a bridge a long way back. But I wanted to explore the environment and how water has shaped the site over millennia. To do so I needed to be close. Very close. While not an ideal position from which to photograph the panoramic nature of the falls, I love how I’ve been able to show the way water has shaped the rocks over millennia. An interesting foreground element is essential in a wide-angle landscape photograph, which is why I put myself in a pretty precarious position to make this image. It was made with at a 24mm focal length on my then Canon 5D Mark II camera over a 15 second exposure with an aperture of f/11 and at ISO 200. 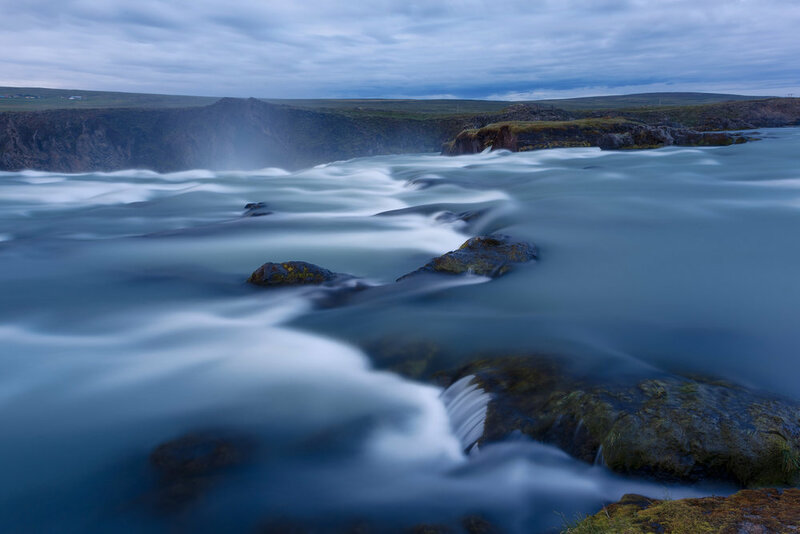 Water cascades over the upper reaches of Godafoss, the waterfall of the gods, in the north of Iceland. I made these photos during the early hours of the morning under pretty gloomy weather. The light caste a cold, cyan/blue color over the landscape which, to my mind, expresses the melancholy mood and the brooding quiet of the location. Traditionally the Icelandic Age Of Settlement is believed to have occurred between 874 and 930 with the arrival of Norse settlers from Scandinavia. It’s said that in the year 1000 AD the Lawspeaker Þorgeir Ljósvetningagoði made Christianity the official religion of Iceland. After his conversion Þorgeir is said to have thrown his statues of Norse gods into the waterfall. Godafoss waterfall, under bluish grey light, has a strangely melancholy beauty very typical to landscapes throughout much of Iceland. As you can see Godafoss is a large waterfall with water cascading from a height of 12 meters and across a 30 meter width. I’ve had the good fortune to travel to Iceland on two occasions. During my last trip I ran a photography tour, which included some great hiking adventures. I’m very much looking forward to my next Iceland adventure, during which time I hope to spend a few nights in the region around Godafoss. Maybe I’II see you there.